Dear saints of God at Bethlehem Lutheran, grace to you and peace from God our Father and the Lord Jesus Christ. Amen. You have heard this morning in our Old Testament that which has become very familiar over many years, the Ten Commandments. It is one of few things in Scriptures where even those who have nothing to do with reading and hearing the Scriptures have some familiarity. You learned them in your catechism instruction, we review them as we review the catechism after the Gospel reading each week, and you have them written upon your heart (Rom. 2:15). In giving these words God declares first and foremost who He is, “the Lord your God.” He is Yahweh, your God. He is the one who just completed the act of bringing His people out of the land of Egypt and delivering them from slavery. In doing so He declares something of the Israelite people as well as you and me today, we are His for He is our God. These commandments of God are not mere suggestions that you may take or leave at your pleasure. He did not give His word as one of many things that is to be taken into consideration in your day to day living. As the Lord’s people He declares within these commandments who you are made to be in Him. How are you doing on simply being God’s people? How are you doing by this standard? Just run through the litany of the Commandments. This is not just make sure that the Lord is at the top of some list amongst others. The literal translation of “before” would mean “before my face” or “in my presence.” Seeing as our Lord is omnipresent, present at all places in all times, it is a radical claim of exclusive worship of Yahweh alone. We should fear, love, and trust in God above all things. There are many ways in which this commandment is brought to the forefront. We are tempted to place the Lord amongst the pantheon of other gods. The same has been true throughout history. Amongst the idols of Canaan, Babylon, and Assyria the people of Israel were tempted to worship other gods. The prevalent temples and participation in the practices of the Greek and Roman gods, even just on a social basis, plagued the early church. The push to have the Lord coexist amongst the gods of Allah, Buddha, or some mystical communing with nature continues today. Of the things we fear, not those that we are afraid of but rather those things which we give reverence and respect, where does our love and trust in the Lord come into play? Quite honestly, how much time is spent in thought, word, and deed upon the things of God rather than things of this world? Just think of how you use your time, your talents, and your treasure on maintaining your financial status, political and social ideals, and even a temptation to place other good things such as our family and friends as the chief source of love and happiness in life. As much as these are good things, they are not God, even these things must be denied in our fear, love, and trust, as we heard last week as Jesus rides on through this Lenten season to the cross and bids us the deny ourselves, take up His cross, and follow Him (Mark 8:34). Where do you silence your fears, where do you place love and trust? In all these things, the devil would use even the things of God to block us from receiving His good and gracious gifts in Christ. Luther wrote in the Large Catechism that all other commandments come through this first commandment. It is in a lack of fear, love, and trust that we fail to use the Lord’s name properly in prayer, praise, and thanksgiving but also leads us to misuse the Lord’s name carelessly. We’d never swear or use our own name as we flippantly use God’s. I remember my dad telling me as my Grandpa made him attend all services (both on the Sunday), and I remember Grandpa telling me the same when we’d visit, that of the Lord’s Day and Divine Service we could attend both services as a small token of appreciation of Christ dying for us. Truthfully, we talk of tithing with time, talent, and treasure, but we usually mean more treasure. What if feared and loved God above all things and tithed our time, 168 hours a week so 16-17 hours a week for the Lord? Yet we value our time so much that the thought of more than just the hour of Divine Service, and maybe Bible Study on occasion but usually not, makes us cringe and feel as if we would be over zealous. Follow through the commandments in a mere summary and we see how the first comes through them all. Love of God leads us love of the neighbor, the person next to you, the coworker, the classmate, the friend as well as the enemy. Honoring father and mother, and adding to that all other authorities, as God’s given authority and structure for your life. Not murdering, that is placing ourselves in position of decisions of life and death. Not stealing, which dovetails in the last two commandments of coveting in which we doubt in love, and trust in what He provides for our daily lives. God’s gift of marriage and the sexual relationship given within it as we circumvent and change His institution to fit our needs and desires. As Jesus comes into the temple at the Passover Feast, He knew all the people and what is in man (John 2:24-25). It is not as we are created and made in God’s image. Our hearts do not bear full love of God and love for the neighbor. Our hearts are sin factories from which all matters of evil come, murder, adultery, theft, false testimony. It is the sin which enslaves us. Sin which clings ever closely to us and is part of our fallen nature. Jesus comes set captives free, to provide release from this sin and death. Our sinful nature constantly pushes us to make deals with God, accepting and obeying in this area but not in this one which may be too politically unpopular, against the expert opinion, or taught and pushed in schools. This “let’s make a deal” syndrome never escapes us completely. But God doesn’t give Himself to us in the flesh of Christ so that we can cut deals with Him. He gives Himself to us in the flesh of Christ simply to turn to us sinful beggars over in abundant mercy! He comes as the fulfillment of what they were doing in temple. He comes to shed blood. He comes to sacrifice Himself. 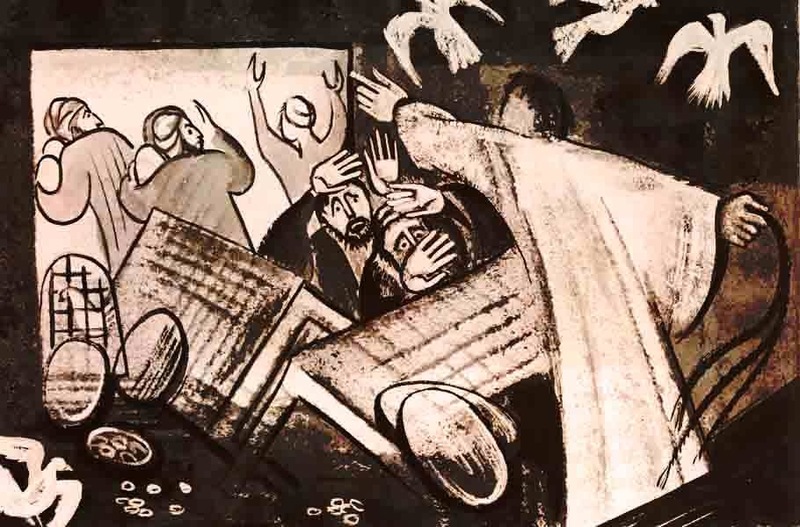 He is not only turning the tables over of the thieves and moneychangers who are defiling God’s house. He comes to turn the tables over the sacrificial system. He comes to turn the tables of our sin, our greed, of our selfishness, of our pride, and of our false worship. He comes to turn the tables of the sacrifices required at various times throughout the year but to make the final once-and-for-all sacrifice for the sin of the world. The help for us who are enslaved to sin is the focus of this very season of Lent. The Ten Commandments crush us. The Law shows us our sin and the death we deserve. If we could keep the First Commandment we could keep them all without fail, but that we cannot do. He who spoke the commandments to Moses on Mount Sinai came to suffer the punishment for our failing of them on Mount Calvary. The dwelling place of God, the temple, comes in the person of Jesus, the Word made flesh as God Himself to fulfill the Law on your behalf and to make the final sacrifice for the sin of the world. In destroying the temple He mentions destroying the place where dwells, that is in Him. As the temple is destroyed more than a mere turning over of tables occurred as the curtain of the temple itself was torn in two. The building would be destroyed in 70 AD. But it was of little consequence. For the temple, God’s dwelling is not merely confined to a building or structure. Churches have come and gone. Churches have existed and been around since the first century. Churches have also existed and proclaimed the Gospel without buildings. Because the temple, the church, is found only where Christ is found, He Himself makes the church. The temple itself was born of the Virgin Mary, suffered under Pontus Pilate, was destroyed, crucified, dead, and buried, and raised from the dead in three days. The temple is present in water and word to give new life this morning to Laura, the same as given to you in those cleansing waters. The temple is present on the altar as the dwelling place of God, the flesh and blood of Jesus, is given and shed for you for the forgiveness of sins. For nothing has changed when it comes to the Lord and His work of redeeming and saving His people. He is ever Yahweh, the Lord, your God, who brought you not from Egypt but from death and hell who redeems you from slavery of sin. The Lord your God is destroyed and risen from the dead forgives your sin and gives you life. That as sin and death are endured, as suffering in this life comes, as sickness endures, as disappointments come, it is all destroyed in the death of Jesus and raised in perfect glory as you are made new in Him on the day of resurrection. This entry was posted in Baptism, Lent, Old Testament, resurrection, sermon. Bookmark the permalink.